We don’t necessarily agree with those sentiments. Client education is huge at Under Pressure Therapeutics. We strive to help you better your lifestyle as much as we can. If you walk in carrying a 50 pound purse on one shoulder and you’re complaining of neck tension, headaches, tired eyes, and numbness in your hand, it doesn’t take much for us to recognize the problem. If you have a desk job and you’re complaining of lower back pain, we critically think of what your regular activities are and feel different muscles to figure out what will help you the most. We not only try to release tension in your muscles, we want to educate you on what you can do to prevent that tension from coming back. Now, I can’t tell you everything you can do, because that list is long, and it varies from person to person. But I can give you a few tips on how to decrease your own pain. Drink water! Water is what helps your tissues heal and your blood move through them, allowing them to be healthy. Water decreases tension simply because your muscles will have more fluid to work with and allows your tissues to be more buoyant. This allows them to deal with tension, exertion, and trauma more easily and will help prevent you from causing more issues down the road. Stretch your hamstrings! With sitting down all day long, the hamstrings specifically get really tight. We also tend to want to be in more of a fetal position, which shortens our hamstring muscles. These muscles, when too tight, can pull on your lower back which can cause or exacerbate lower back pains. Stretch your pecs! Much like the hamstrings, your pecs are muscles that like to be shortened with our everyday activities. Stretching them out will help shoulder pain. Stretching your pecs can also prevent a myriad of painful situations, like Upper Crossed Syndrome, Thoracic Outlet Syndrome, shoulder pain, and more. Look at what you carry! Do you carry a 50 pound purse or a 75 pound diaper bag? Do you carry a 30 pound briefcase? Do you put your wallet that’s the size of a young adult novel in your back pocket? Do you carry children or books on a regular basis? Do you think you can carry the 13 cans of food, 4 bottles of beverage, and 10 bags of vegetables at the store to prevent yourself from grabbing a cart? STOP IT! Carrying anything for extended periods of time really causes a TON of problems in your body. 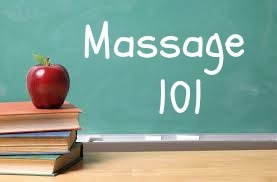 Depending on what you’re carrying for how long will determine how it’s affecting your body, but your massage therapist can give you stretches or tips to do specifically for you. However, if you don’t lose the “extra weight,” those exercises won’t yield lasting results. Size your clothes correctly! If your pants, bra, or dresses are too tight, your muscles fight against them. Those muscles then have to work twice as hard just to function. So many people come in complaining of mid-back pain, and I see how tight their bras are. I tell them to get sized. Their pain goes away. It’s amazing. It’s a quick, easy fix. It helps tremendously. Make sure you’re wearing clothes that are your size and that fit you. It’s something small that can make a world of difference. Depending on what you specifically have going on in your body, your massage therapist can give you stretches, tips, and suggestions to help you move into a healthier lifestyle.